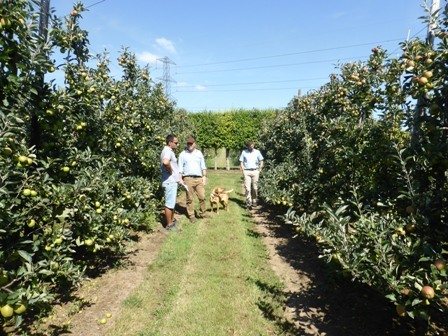 An early start on Tuesday as The English Apple Man met up with fellow Judge Stuart Clark and Chief Steward Alex Radu at The Barnyard at Gore farm in Upchurch. 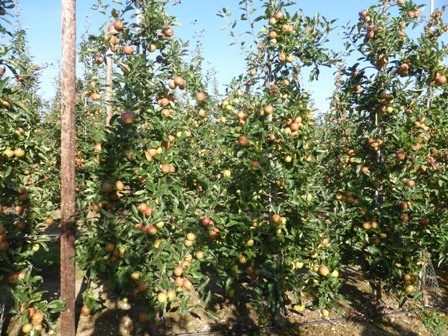 First on our list; two Gala Galaxy orchards at Gore farm. 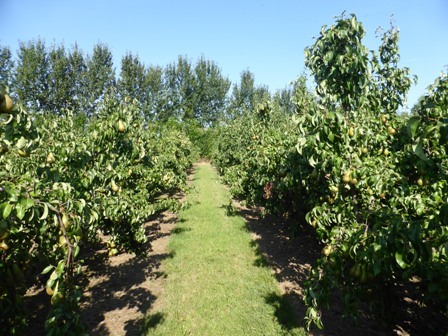 Our next stop; Miers Court farm at Rainham (Kent) where an orchard named 'Young Pears' carried a good crop of Conference pears. 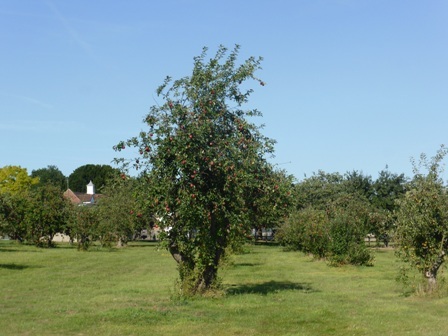 Below: The English Apple Man always enjoys these 'forays' into areas he may not have frequented before and at Miers Court, this remnant of an old Tydemans apple orchard caught the eye. 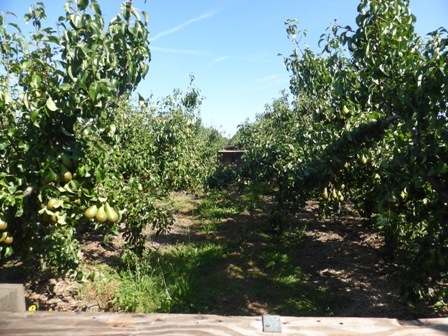 From Miers Court, we took the short journey to Pump Farm where a Conference Pear orchard with the identity; Block 4 Conference pears was next on our list. 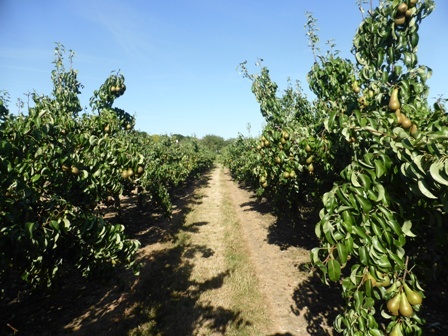 From Pump farm we drove north to Childs Farm at Cliffe, where the Long family have 'long been' among the very best pear growers in the UK. 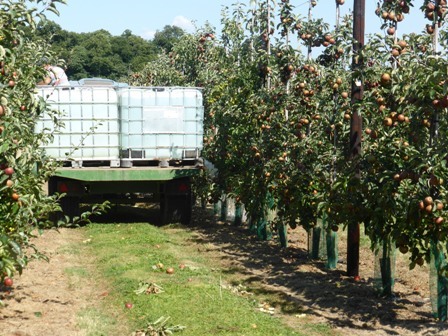 David Long now manages the family business and has continued to win awards in orchard competitions. 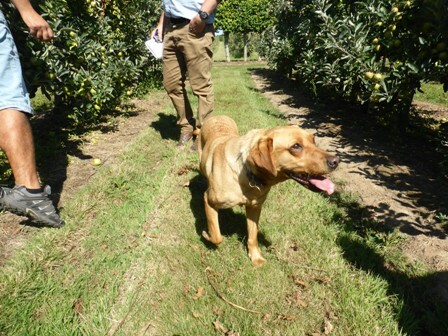 We judged two of David's orchards; one named 'Georges' after his son George and a second at nearby Dux Court. 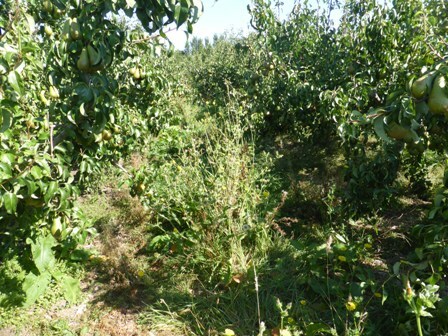 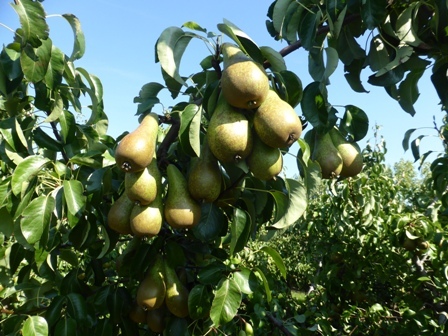 Controlling 'Pear Sucker' has always been a challenge for UK pear growers and in some cases growers have given up the fight; today the use of predators instead of chemicals has changed the perspective. 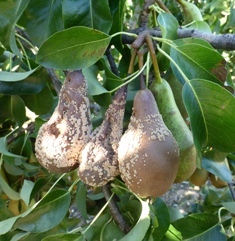 David has developed a system for 'monitoring and controlling pear sucker' - David set about introducing Anthocorids for their predatorial skills with pear sucker. 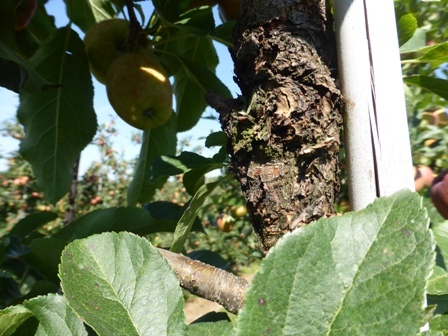 Anthocorids favour nettles as a host plant and by increasing the presence of nettles, the Anthocorids had a safe haven when not required as pear sucker predators. 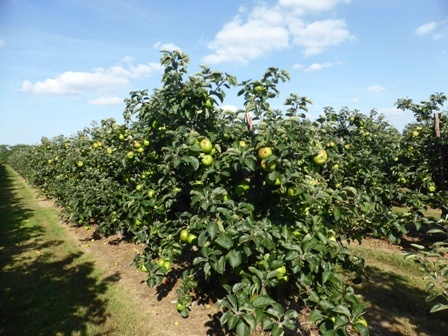 By late morning we had arrived at Adrian Scripps Ltd Parsonage Farm at Cobham. 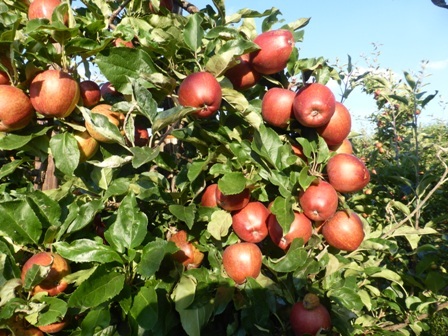 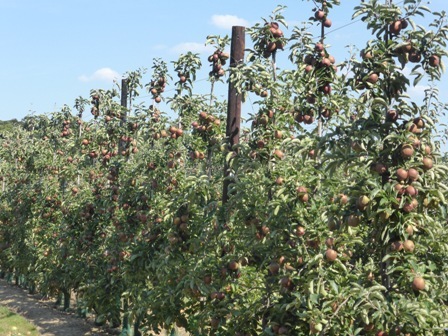 This farm consistently grows heavy yields of Braeburn, Gala, Bramley and Red Prince. 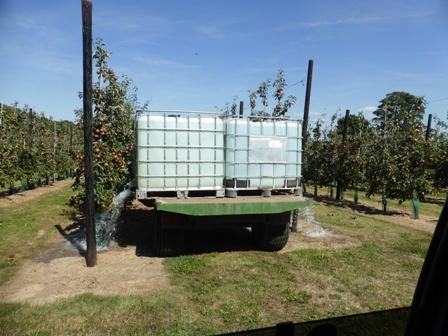 The Red Prince orchard does not have irrigation and after an exceptionally dry July and the recent spell of hot weather is beginning to look 'stressed' - so this watering system, with 4 large tanks and four outlets, delivers large volumes of water beneath each tree. 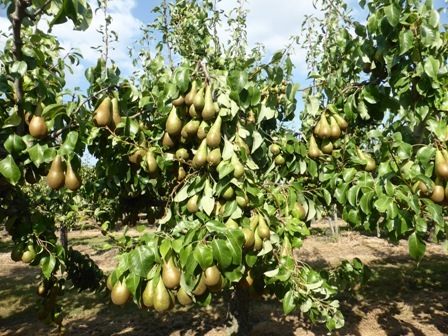 1pm and by this time we were in need of refreshments and The Leather Bottle in Cobham was close at hand. 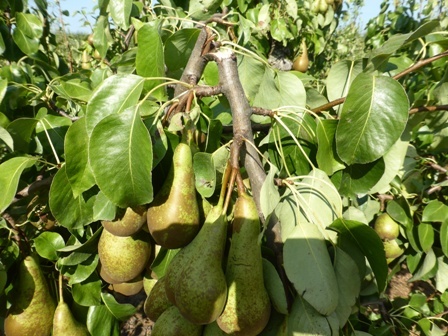 Click on The Leather Bottle for more information. 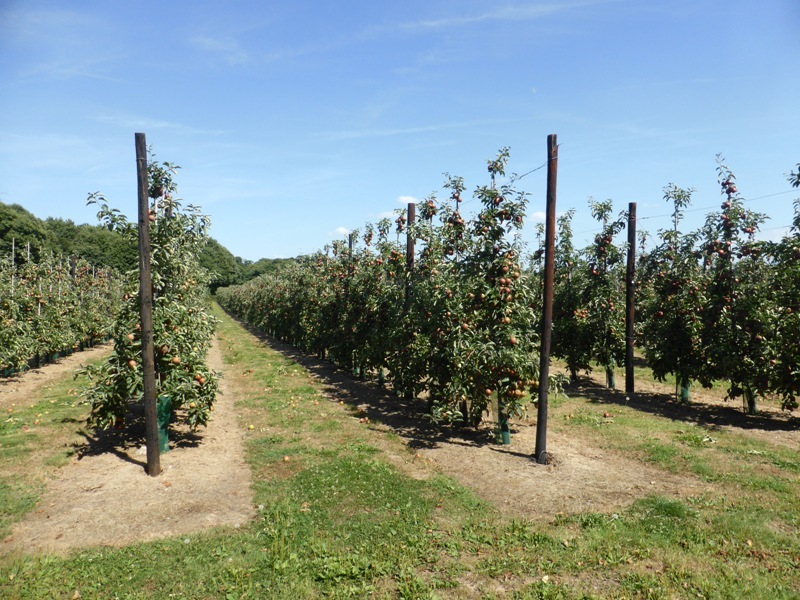 After lunch we traveled via the M2 to Faversham for our next stop at Elverton Farm where we judged Gala Royal Beaut, Bramley and Conference pear orchards. 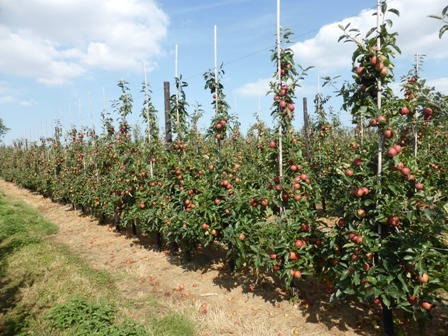 Here Thomas Johnson has planted Gala Royal Beaut one of the newest Gala clones which is being planted by many growers due to its natural characteristic of delivering very good colour earlier than the older Gala clones. 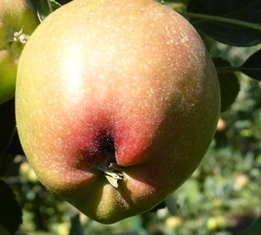 From Elverton we moved on to Simon Bray's 'Monks Farm' at Norton. 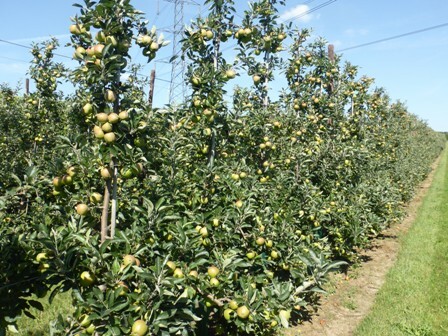 Simon entered two orchards, one 'Boyce' a Bramley orchard and the second a Jonagold orchard. 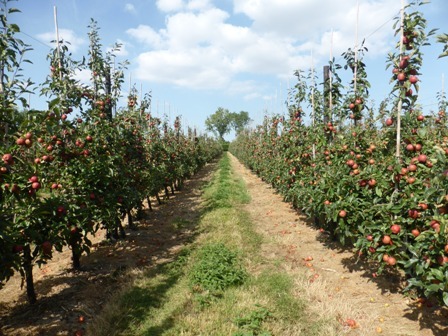 One can be sure of Simon Bray challenging for the honours in any orchard competition and this was no exception. 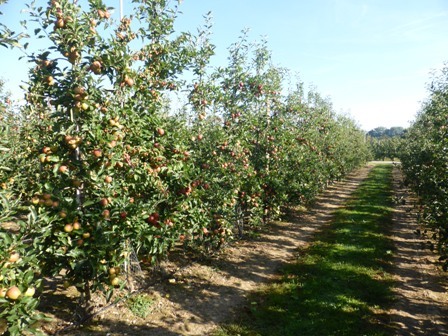 Simon's 'Boyce' Bramley orchard scored an astounding 99 out of 100 to win the Culinary Orchard prize. 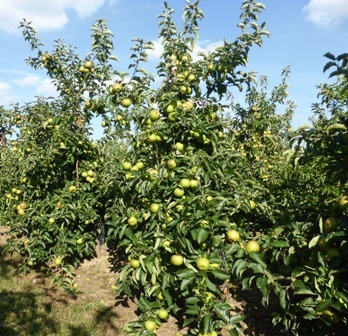 Simon also entered his Jonagold orchard and it is difficult to imagine how these heavily laden trees could carry any more fruit. 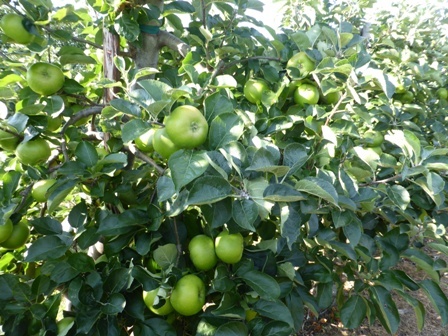 Grown primarily for juice, Simon said when he planted them the juice price was higher, but with today's prices it is difficult to make any money from Jonagold, however large the crop. 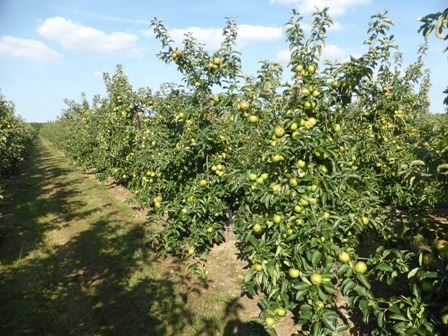 Next on our list; A.C. Goatham & Son Bramley orchard at Bredgar. 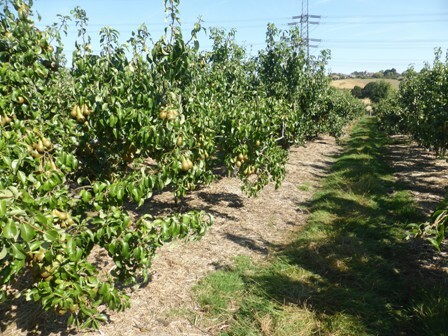 Named Motorway Bramley; the M2 is on the other side of the hedge; this orchard is very even in tree management and crop. 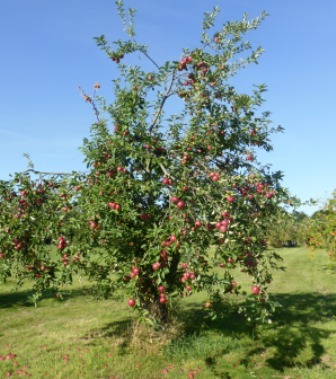 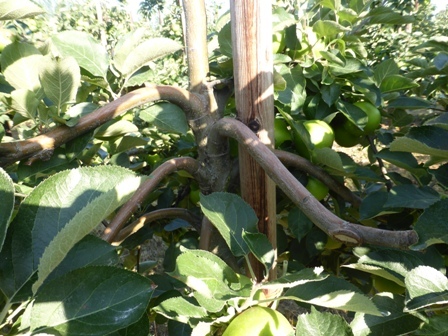 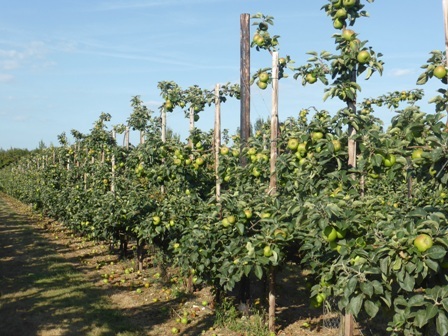 The branch angles have been set to maximise balanced growth & yield, the leader is well populated with fruiting lateral branches with none allowed to become dominant; this results in a balanced tree with an even spread of apples. 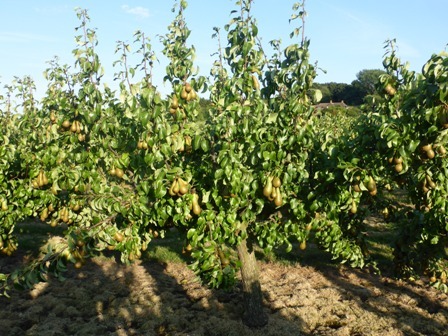 Our last 'port of call' was Henry Bryant's orchards at Newington; Bramley, Gala and Conference pears. 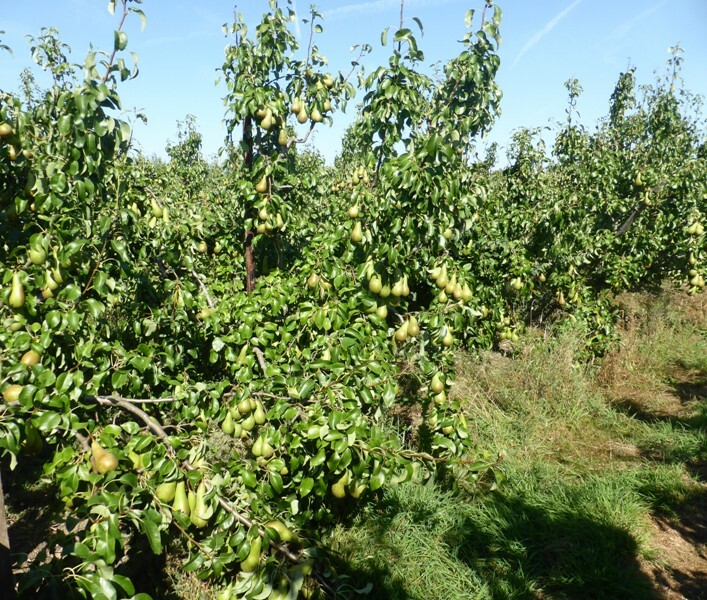 We saw some excellent crops of good quality apples and pears which augers well for the coming harvest. 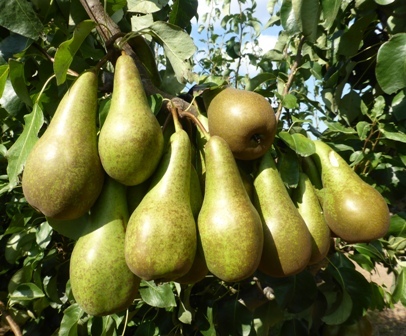 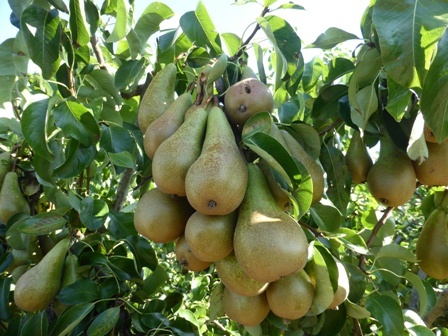 Some of the pears are carrying very heavy crops, so much so that branches are breaking down with the weight of fruit. 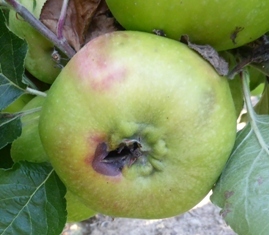 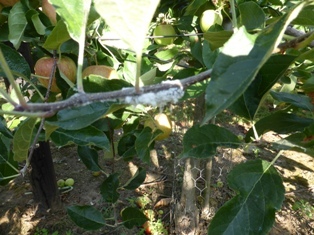 Each season brings its own challenges and this season woolly aphids are found in most orchards; canker is always a problem, particularly (but not exclusively) in Gala orchards; Nectria eye rot and brown rot are evident and may become worse if the weather deteriorates at harvest; sun-scorch is very evident in many orchards.